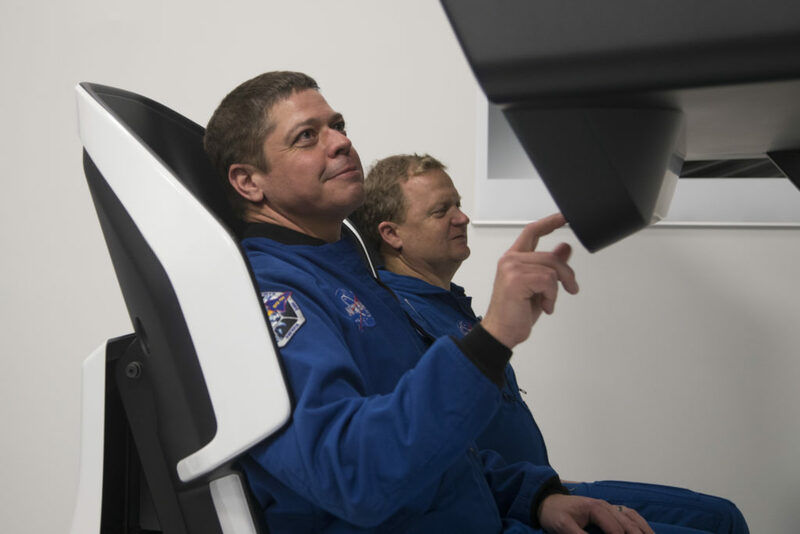 Astronauts Bob Behnken, left, and Eric Boe evaluated the controls, seating and other aspects of the crew compartment of SpaceX’s Crew Dragon spacecraft during a recent visit to the company’s headquarters in Hawthorne, California. Sitting in a mock-up of the Crew Dragon cockpit, the two studied many aspects of the layout including spacing of displays and ease of movement. The testing is taking place as SpaceX develops the Crew Dragon with an eye toward launching the spacecraft into orbit in the near future on a flight test to and from the International Space Station. Later, the Crew Dragons, launching atop Falcon 9 rockets, will perform operational missions to rotate crews aboard the orbiting laboratory. Companies build high fidelity models of their spacecraft and systems to help determine everything from practicality and operation to fit and comfort. Boeing also is building a spacecraft and launch system to take astronauts to and from the station. Both companies are developing their systems under contracts with NASA’s Commercial Crew Program as the agency strives to return America’s human launch capability with domestic companies. 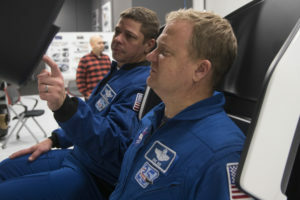 Behnken and Boe along with Doug Hurley and Suni Williams are the four NASA astronauts who travel across the country to evaluate design and manufacturing by Boeing and SpaceX. The astronauts have not been assigned to specific test flights yet and are pooling their test pilot expertise and engineering prowess to help the companies meet NASA requirements. Other astronauts also take part in the analysis of spacecraft, launch vehicles and the myriad ground systems that are under construction to make sure they meet NASA’s strict requirements for use, safety and reliability. Photos by SpaceX.